A month ago, we have received several inquiries from new customer. They need to customized Titanium alloy CNC machining parts. For this material, maybe most of the customer is unkowned, or only heard it before. Today we will further introduce Titanium alloy parts. The material cost is expensive. At present, the titanium alloy material is very expensive at our marketing, the price is:$60/kg, some of them even over $100/kg. This price is beyond than other metal parts. Even if the cutting force of titanium alloy parts is slightly higher than steel, but its physical phenomenon is relative complexity than steel, so it will be faced with bigger difficult on the production process. 2, by the cutting process caused the high temperature, it can destroy the surface integrity of the titanium alloy parts, resulting in the decrease of the parts geometrical precision. 3, the elasticity of titanium alloy may be beneficial to the performance of the parts, but the elastic deformation of the parts are the important cause of vibration during the cutting process. The cutting pressure causes the “elastic” parts to leave the cutter and rebound, thus make the friction between the cutter and the part is bigger than the cutting action. The friction process also cause of heat, which aggravates the thermal conductivity of the titanium alloy parts, so the defective products also will more and more. Based on the properties of materials, titanium alloy parts are easily deformation when machining, especially some easily deformed products, such as: thin wall, ring etc, which is even more serious. Because it is not easy to be machined to the expected dimension accuracy with thin wall titanium alloy material, so we can’t control the tolerance of titanium alloy products. Most of titanium alloys have low heat conductively, with only 1/7 of the steel, 1/16 of Aluminum. Thus the heat will not be transmitted quickly pass on the parts on the cutting process of titanium alloy, only collection in cutting areas, so the temperature above 1000 degree quickly, thus the tools are cracked easily. Of course, maybe there are some others reasons to affect the final price. But anyway, the titanium alloy cnc machining part cost is relatively higher than other metal parts. As one professional cnc machining shop, Creatingway also can machining this material, but we need to understand the functions and applications of the parts before production, thus reasonable to choose and machining it as our customer requirements. 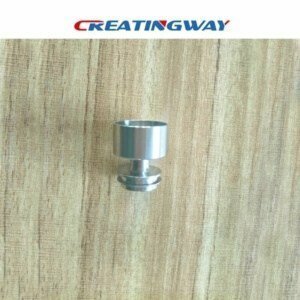 In additonal, Creatingway is concentrate on CNC machining manufacturing, prototype machining, low-volume manufacturing, metal fabrication and parts finishing services, provide you best support and services. ask us one inquire now.